​We hope that you'll follow along with us while to look forward to the 2018 / 2019 NBA Basketball season. Below are some fun numeric facts taken from the Birth Chart of the NBA compared against the Game itself. 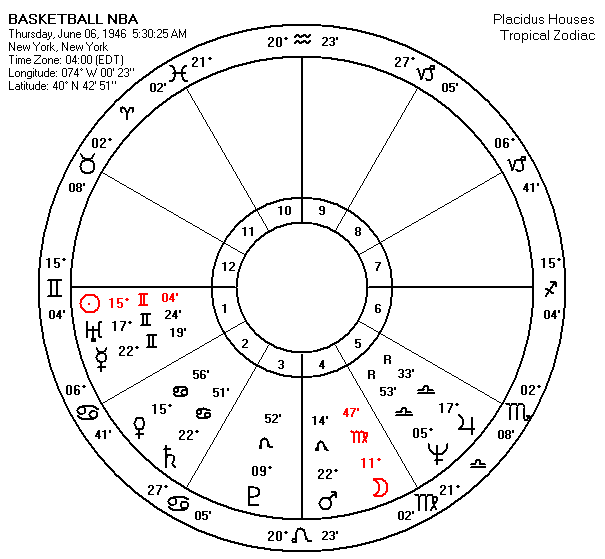 The NBA began on June 6, 1946 in New York, I set their birth chart for Sunrise on that day. How apt is it that Mercury measured 082° of celestial longitude and that the boys play 82 games in a season. 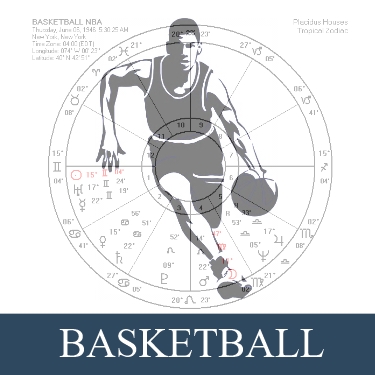 082° of the ecliptic is 22 degrees of Gemini and a 3 pointer starts at 22 feet away from the basket. There are always 5 starters and 5 minutes of OT if a tie and Neptune holds 5 degrees of Libra in the birth chart. Three planets, Mercury, Mars and Saturn hold 22nd degree of their respective star sign signatures. Basketball Hall of Famer, Clyde Drexler, wore the number 22 and was named one of the basketball's fifty greatest players as of 1996, he was also born on June 22, in 1962.